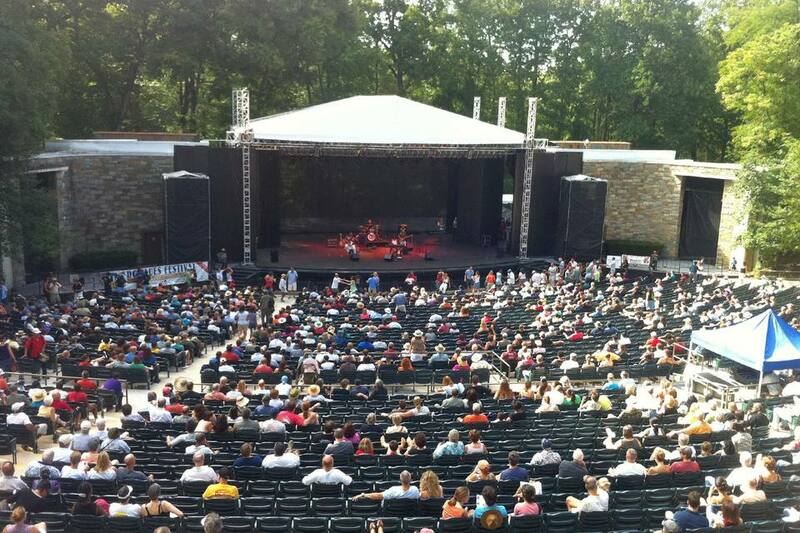 Carter Barron Amphitheatre is a 3,700 seat outdoor concert venue in a beautiful wooded setting in Rock Creek Park. The facility opened in 1950 in honor of the 150th Anniversary of Washington, DC as the nation's capital. The Washington Post sponsored several free summer concerts at the Amphitheatre from 1993 to 2015, but that series has been discontinued. As the result of a structural assessment, the National Park Service determined in 2017 that the Carter Barron Amphitheatre stage had structural deficiencies and could not safely support the weight of performances. Like the years since then, this means there will not be concerts or other performances at the Carter Barron this summer. The initial plan to build an amphitheater in Rock Creek Park was established in 1943 by Frederick Law Olmsted, Jr. This plan was expanded upon by Carter T. Barron in 1947 as a way to memorialize the 150th Anniversary of Washington, DC as the nation's capital. The original construction cost estimate was $200,000 but the actual cost was more than $560,000. The amphitheater opened on August 5, 1950. The amphitheater was dedicated to Carter T. Barron, the Vice-Chairman for the Sesquicentennial Commission after his death in 1951. The facility has not changed much over the years. Minor upgrades have been made and all new seats were installed in 2003-2004 but extensive renovations need to be completed before it can be used for concerts again. Free Summer Concerts in Washington D.C. The National Park Service recommends the outdoor concert series at Fort Dupont as an alternative to the Carter Barron Amphitheater. There are also free summer concerts at places like at Washington Harbor in Georgetown, and lunchtime concerts take place at the Woodrow Wilson Plaza in front of the Ronald Reagan International Trade Building from late July through late September. The amphitheater is located in Rock Creek Park, 4850 Colorado Avenue, NW (16th Street and Colorado Avenue, NW) Washington, D.C.
Free parking is available in the lot adjacent to the amphitheater. Neighborhood parking is restricted. Carter Barron is not directly accessible to Metrorail. The closest Metro stations are Silver Spring and Columbia Heights. From these stations, you must transfer to the S2 or S4 Metrobus. Visit Fort Dupont Park in Washington, D.C.